Discovered by Hodierna before 1654. NGC 6530 is an extremely young open cluster which was formed from the material of the Lagoon Nebula M8, and it is situated well within this diffuse nebula. This cluster was apparently first observed by Hodierna before 1654, and independently found by Flamsteed in 1680, who cataloged it as his No. 2446. 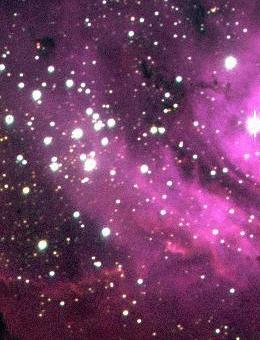 NGC 6530 was classified as of Trumpler type "II 2 m n" (see e.g. the Sky Catalog 2000), meaning that it is detached but only weakly concentrated toward its center, its stars scatter in a moderate range of brightness, it is moderately rich (50--100 stars), and associated with nebulosity (certainly, with the Lagoon nebula). As the light of its member stars show little reddening by interstellar matter, this cluster is probably situated just in front of the Lagoon Nebula. Its brightest star is a 6.9 mag hot O5 star, and Eichler gives its age as 2 million years. Woldemar Götz mentions this cluster as containing one peculiar Of star, an extremely hot bright star of spectral type O with peculiar spectral lines of ionized Helium and Nitrogen. Our image was cropped from a larger Lagoon Nebula image by Tim Puckett. 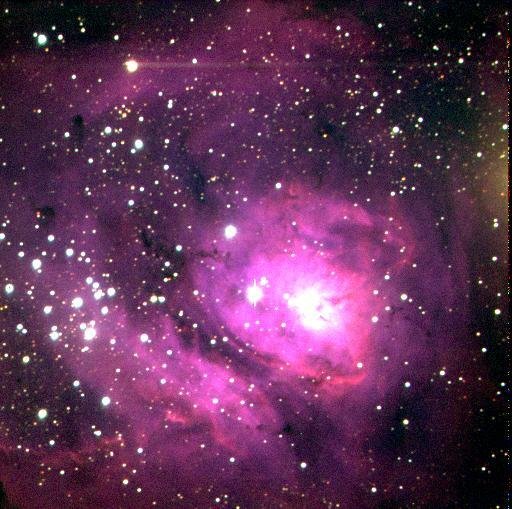 NGC 6530 can be glimpsed in many images of the Lagoon Nebula M8.